Bucks that have been relatively nocturnal are starting to venture out in daylight hours. Some of my hunting buddies forgo the early archery season. “Too many other options,” some say. “The hunting doesn’t get good until the rut,” say others. I can’t argue. Autumn in Michigan provides us with world-class waterfowling and fall fishing, some of the best upland game bird hunting in the country, terrific turkey, bear, rabbit and squirrel hunting, even an early elk season for a select few who win the annual elk lottery. Some of the best waterfowl hunting around occurs up and down the Great Lakes corridors. Don’t believe me? Check out the opportunities that await at our Wetland Wonders, seven managed waterfowl hunting areas in southern Michigan (Nayanquing Point, Shiawassee River, Fennville Farm Unit, Fish Point, Muskegon County Wastewater Facility, Harsens Island and Pointe Mouillee). Click here for more. Year after year, Michigan is the No. 1 state in the nation in woodcock harvest and production and one of the top three or four states for ruffed grouse (partridge). Check out our nationally acclaimed Grouse Enhanced Management Sites (GEMS), 19 locations across the Upper Peninsula and Northern Lower Peninsula that are managed to produce quality upland game bird habitat. Click here for more. If turkeys are your target, don’t overlook the state’s Turkey Tracts, public hunting areas where intensive turkey habitat projects have occurred. 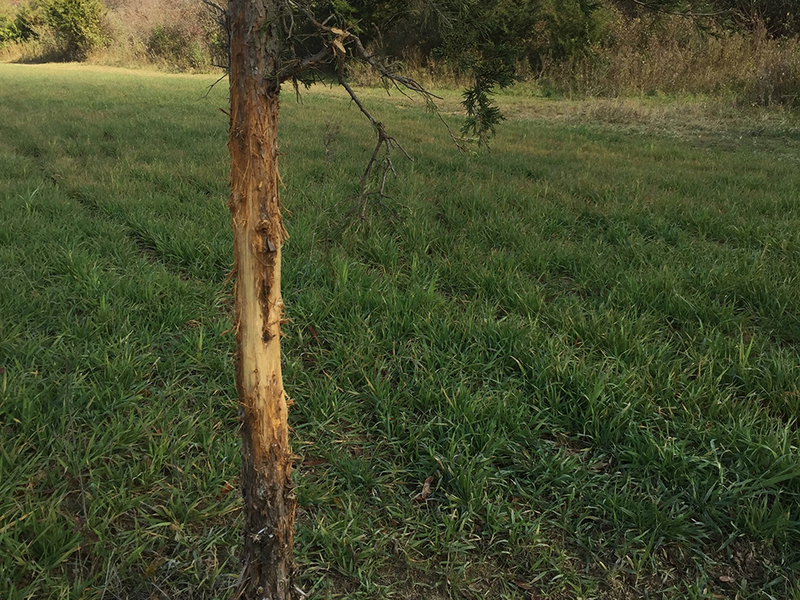 Rubs like this one on a cedar tree indicate that a mature whitetail is in the area. Some of the best fishing of the year occurs in the fall, whether your target is walleye, northern pike, bass or even panfish. And don’t forget about the phenomenal steelhead fishing that awaits in Michigan’s Great Lakes tributaries. Michigan has more than 11,000 lakes and 38,000 miles of rivers and streams, including over 300 named rivers. Stand anywhere in Michigan and you are never more than six miles from a lake or stream. All that opportunity aside, if whitetail hunting is on your agenda, now is the time to head for the woods. 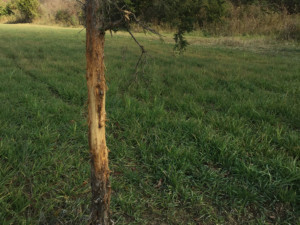 Bucks are tearing it up right now, creating rubs and scrapes in an effort to show their dominance to other bucks and to let does know they are ready and waiting. Now through the middle of November is the most exciting time to be in the whitetail woods. In the past week, I’ve seen more activity than I’ve seen all season long. Bucks are sparring, and some are downright battling it out. (I’ve seen several trail camera photos of bucks with broken antlers.) 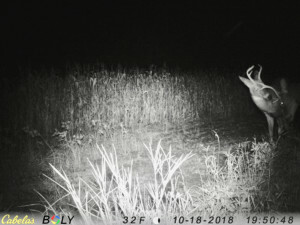 Bucks that have been all but nocturnal so far are showing up in daylight hours, and the amount of rubs and scrapes that have popped up is nearly overwhelming. It seems like every deer trail I venture down is ripped up with rubs and scrapes. 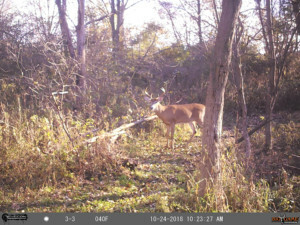 Action is heating up in the whitetail woods with sparring sessions and downright battles taking place between local bucks. If you are a bowhunter waiting for the action to heat up, now is the time to nock an arrow and get out to your favorite stand. Bucks are antsy, but the does are still a week or more away from estrus. So now is a good time to try to fool a buck into coming your way. 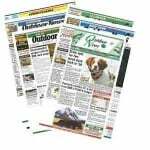 Use calls and scents or try rattling up a buck. 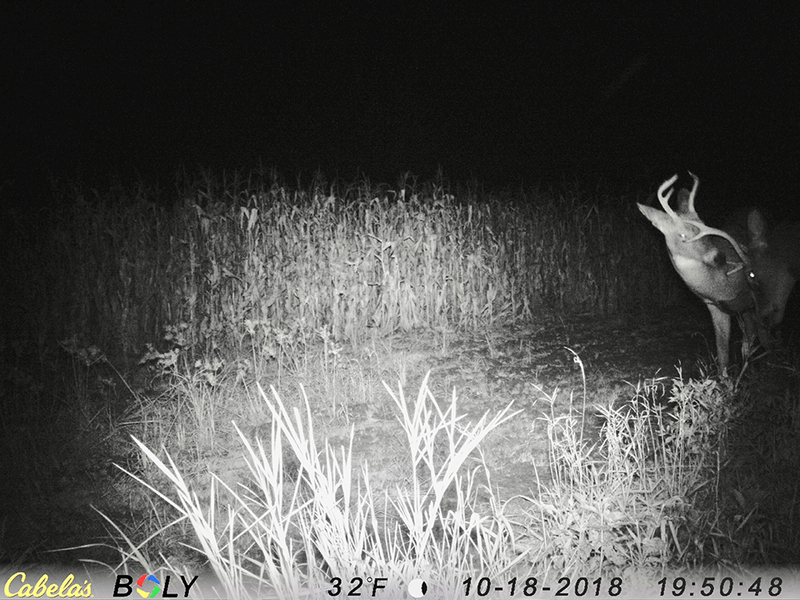 Try anything you can to raise a bucks curiosity so he will visit your stand site. Once the rut starts, bucks will be locked down with receptive does, or on the move trying to find a mate. Remember, your scent is still a surefire way to keep whitetails at bay. One whiff of human odor and the game is over, so be sure to do all you can to eliminate your human scent and absolutely use the wind to your advantage. There is no better time to be in the whitetail woods than now.